What if you had a trusted friend to guide you through God's Word every day? Whether you want a fast overview of the grand story of the Bible or a deeper exploration of the riches of Scripture, "The Wayfinding Bible" is that guide.With an innovative, full-color visual guide at the top of each reading, "The Wayfinding Bible" provides you with three paths through God's Word: the Fly-Over Route, the Direct Route, and the Scenic Route. Following the Fly-Over Route, you'll cover the most important events in the Bible in just 40 readings, giving you a fresh overview of how these events tell the story of God's redemption. Following the Direct Route's 200 readings, you'll develop a better understanding of how God's story develops through history. Following the Scenic Route, you'll explore new territory while discovering a richness and depth in God's Word that you've not seen before. All without the discouragement of getting bogged down in any single book.Whether you are encountering the Bible for the first time or simply looking for a new journey through Scripture, you will always know where you are and where you're going in God's Word. Just choose your route, and prepare yourself for life-changing experiences with God. Special features: Getting Your Bearings: These 8 two-page articles occur at major turning points of Scripture and help the reader stay on track Side Trips: Explore a known concept in greater depth or read about a topic for the first time Scenic Overlooks: Stunning visuals including maps, photos, infographics, and charts that aid in understanding the Bible text. The Wayfinding Bible presents us with a little more updated translation, the NLT (New Living Translation). I have grown up mostly with the NIV and some NKJV. The NLT offered a little clearer presentation of the well known Bible stories we have grown up with. As I read through this Bible, I found it to be a smoother read. The Wayfinding Bible isn't just a Bible that presents us with a more modern translation for our language, but it offers a more in-depth look into the Bible. This Bible was a combination of a study Bible and Bible dictionary. It was fantastic to read through this Bible and be presented with color photographs of the area where these stories took place, charts and graphs to show the prophesies of the Old Testament matched to the events of the New Testament, and color maps and diagrams of Noah's Ark. I will be honest and admit, I've never been a huge fan of the family trees in the Bible. I know they are important, don't get me wrong. This Bible presented the lineage in a more understandable way for me, it was broken down into a true family tree, where you could follow the branches. I was able to understand it better. 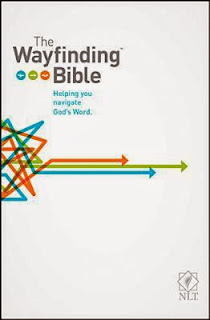 As the name suggests, The Wayfinding Bible, helps you find the way through the Bible. It offers three routes through the Bible: The Flyover Route, The Direct Route, and The Scenic Route. I worked my way through the Flyover Route. It was the path that took you through the main points of the Bible in 54 readings. I was led the whole way through following the reading guide and the arrows toward my next page. It was an interesting way to read through. The two other paths, The Direct Route will get you through in 215 readings and the Scenic Route will take 386 readings, present a lot more information and more details to the stories. Along the way, you have stopping points to keep you on the right path. I look forward to reading more and following the different routes offered in The Wayfinding Bible. My kiddo even enjoyed looking through this Bible with me as well. It helped in offering us a new jumping off point on a Bible story she hasn't heard yet or the pictures gave her a better idea to what we read about. It's a Bible that can offer something to a lot of people at different ages! Thank you to Tyndale House, I received a copy of this Bible for free in exchange for my honest opinion.